With the whoosh-whoosh-whoosh of helicopters overhead, I ventured into a cold, winter San Francisco night and down to László Bar, my next stop on Mission on Mission. As my evening began, a protest gathered in the Castro to challenge the passing of Proposition 8—accounting for the aerial surveillance. I had to wonder, what can three helicopters really do to hold off a crowd of thousands? I wondered if protesters would spill onto Mission Street or if I was too far on the outer periphery of the neighborhood. László Bar has two doors—one on the street which is found between a few tables outside the bar, and a second door down the long hallway leading up to Foreign Cinema’s hostess station. I entered through the side and found the bar comfortably full, but not packed. 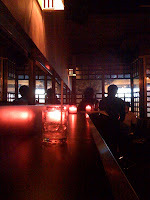 Upstairs a mezzanine offered a curtained seating area which hovered vacantly over the bar area. The corners of the bar buzzed quietly with small groups enjoying cocktails, and the bar stools were all spoken for as couples sipped their $8 drinks and waited for tables at Foreign Cinema. I chose a spot along the wall that had stools and a thin landing to place my beer. Over the doorway a large, contemporary painting reminiscent (or a direct replica) of a communist propaganda poster, announced the bar’s ironic socialist-chic vibe. Lighting inside was dim with a faint orange glow radiating from the pendant lights above the bar. A TV in the corner added its own shimmer to the surrounding bar. Though the lighting was dull I quickly noticed the difference between László’s clientele from that of the other bars I’d visited so far. A new-to-me SF crowd—these folks were not hipsters or rockabillys, and they weren’t Latino—rather the place was packed with Europeans, yuppies and the over-40 crowd. Opting for a subdued pallet, the patrons of the bar all seemed to don every shade of gray and black, and my brightly striped orange and yellow sweater seemed to clash with the rest of the crowd. Though the bar’s website promotes the DJs that spin nightly and considers it a Euro-friendly which was evidenced by the many European accents I detected through the low music. Despite its promises of a clubish atmosphere, I couldn’t quite imagine the place packed with dancers and loud music. With its urban, minimalist décor, the prospect of house music ricocheting off the bar’s steel and concrete corners seems potentially unpleasant. 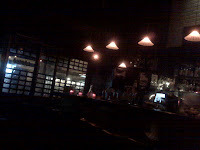 Cozy is not the word I would use to describe László Bar especially on a brisk evening like last Friday night. But somehow, through its bare interior—with glass doors, ice block windows and masonry—there is a certain kind of warmth to the place. Over the two hours, a steady flow of patrons in overcoats and wool scarves found their way into the bar to join friends for a pre-dinner cocktail, but I was hard pressed to single out anyone who looked like a habitual visitor. More than anything László’s seemed to like a nice place to enjoy a relaxing layover before moving on to a main event—wherever that might be. Leaving László Bar I could almost feel Mission’s tide turning from dive bars to trendy lounges. László did its best to bring the Eastern Block’s cold edge to San Francisco–for this Friday, I am hoping that San Francisco can serve up one more warm, Friday night as I make my way to the Mediterranean ambiance of Medjool’s Sky Terrace.